Now that I have a 1-month-old child again, it has become abundantly clear that there are times when people just don’t know what to say to me. This is the third time I’ve been through this stage, and the comments are always the same. Sometimes people who don’t know you well are just grasping for topics to talk about, and sometimes people with no kids are just clueless. It’s not their fault; they just haven’t been through it. 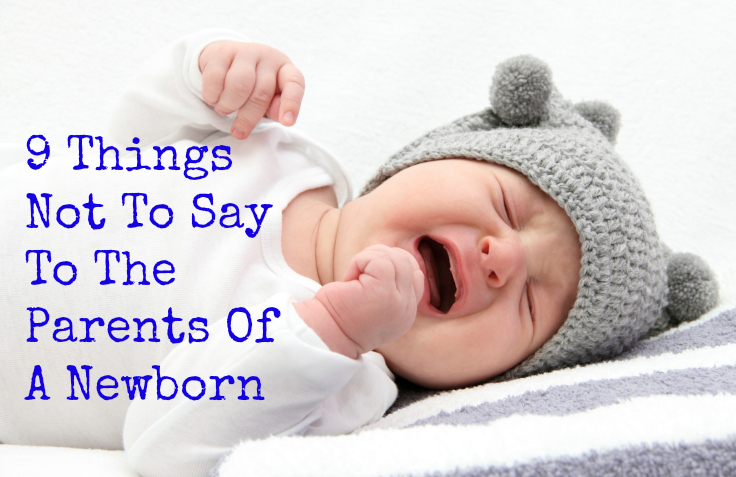 So consider this a guide to inform you about what not to say to those people who are in the middle of trying to figure out life with a newborn. Some of these are questions, some are statements, but none should ever leave your mouth when speaking to a new parent. What do you think? Parents of newborns generally walk around like extras in the show, The Walking Dead. If you see parents of newborns who don’t look like this, they are most likely numb to the sleeplessness. Another possibility is the grandparents have just swooped in like heavenly angels and woken up throughout the night with the little devil, uh, I mean baby. This is the number one question asked of me. Just don’t go there, the answer is always the same. I have a newborn. Like I have the time or energy to remember who told me to “ask them if I need anything.” My mental capacity is near empty; if you want to know why, see #1 above. Some good questions would be, “What can I bring your family for dinner on Thursday?” or even, “Can I pick your kids up from school tomorrow and take them to the park to play?” Either of these is like a miracle from above. Don’t make me call you and ask — just tell me what you can do and when. And bring dessert with you. Dessert is never bad. Why yes. At 2 weeks old he is a medical freak of nature and sleeping all the way through the night. With all the extra time on my hands from him sleeping so much, I have been researching new fashion trends. The one I am trying right now is called “Death Warmed Over.” Do you like it? It’s the newest look, especially among parents of newborns. Really, do you now? Last time I checked, it was still illegal to lock up a baby in the dog kennel when it’s in the way or you just can’t handle any more of the messes. Did you have to get up to nurse the puppy at 2 a.m., 4 a.m. and 6 a.m.? I also don’t think you woke this morning to a screaming little one covered with poop up to their armpits. I swear diapers aren’t designed to hold it in, they actually are just there to channel poop up the baby’s back. I could go on and on with this one, but you get the picture. Listen, I didn’t ask for your advice and I probably know exactly what my baby needs. Unfortunately, I am barely holding it together, haven’t showered in four days and honestly couldn’t care less what your opinion of the situation is. If you want to actually help, give me your place in line so I can get out of the store faster. You need to understand that getting a newborn out of the house can sometimes feel as daunting as defusing a bomb in under 30 seconds. Besides that, stupid people always want to touch newborns’ hands, which spreads germs and sickness all over the place. And sick babies don’t sleep… ever. So thanks for the offer, but our newborn will come out to play when we are good and ready. While adding another pooping machine to the fold is awfully tempting, we will hold off making that decision for now. People should never make important decisions while exhausted, stressed or in the middle of a major life change. Well, guess what? Having a newborn means we are dealing with all three of those. Also, if every parent of a newborn made that decision right away, no kid would ever have another brother or sister. This baby is a miracle, and having him is one of the greatest moments of my life. We are a month in and I would do anything for him. Every dirty diaper, sleepless night and mind-numbing children’s song is nothing compared to the joy of being a parent. I will never have a regret about giving up some of my freedom (and sleep) to raise my child. I just pray that I can be the parent all my children deserve and have a ton of fun at the same time!